Nova Scotia has quite a lot of small but interesting towns which offer fascinating glimpses into early colonial history of the region. And since I read a lot about the subject it was time to visit some of them. From Halifax we headed along the coast in a south-westerly direction. 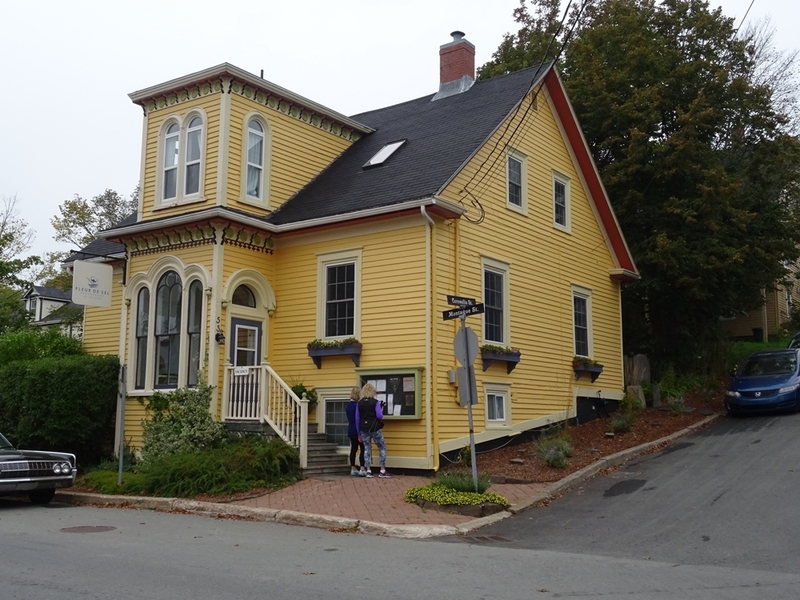 Our first stop was the community of Mahone Bay, located around 90 km from the capital. It really is a small place, with a population of only around one thousand, but it has a rich history and plenty of interesting architecture. 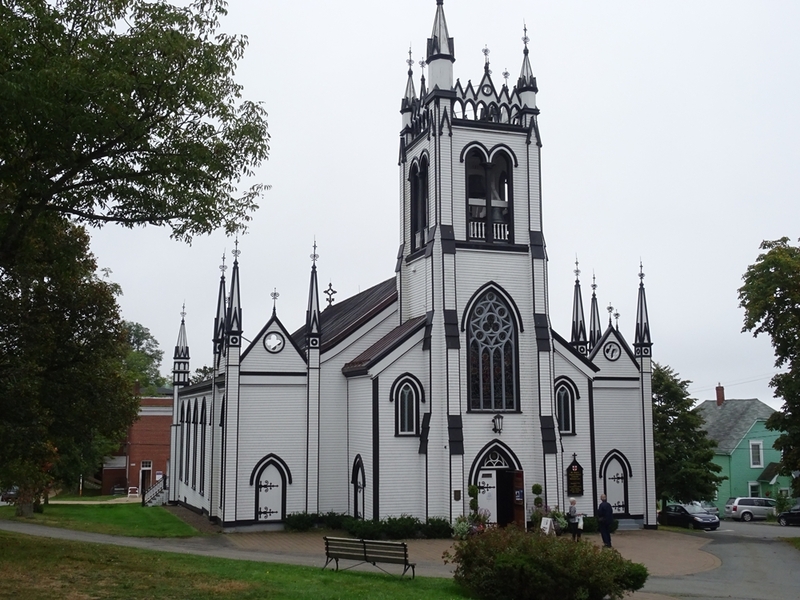 The town was founded in 1754 and settled by German and Swiss protestants who were attracted by the British authorities which were desperate to strengthen protestant population of the region as a counterbalance to the Catholic, and French speaking, Acadians. 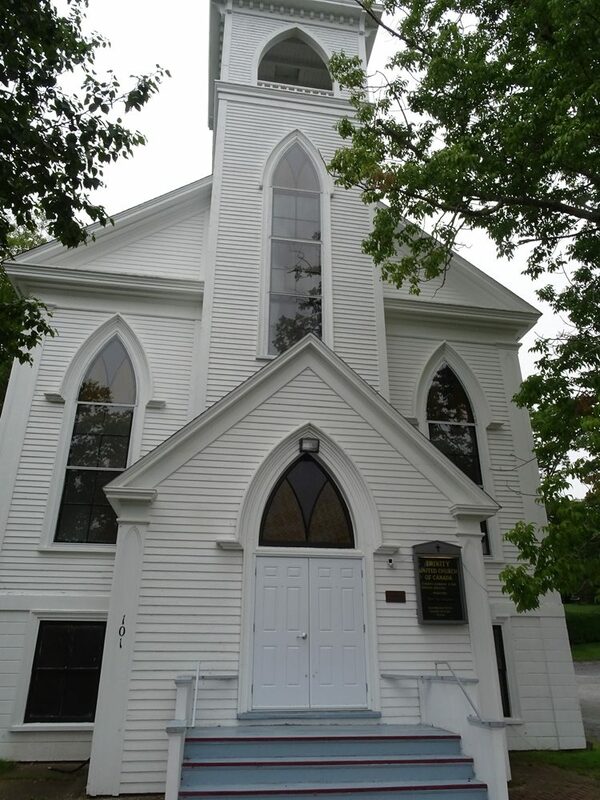 While approaching the town from the north and, driving along the bay, we encountered one of the classic Nova Scotia views: the famous three churches of Mahone Bay (St James’ Anglican; St John’s Evangelical Lutheran; and Trinity United). They stand majestically next to each other and reflect in still waters of the harbour. It has become an iconic image of Nova Scotia, frequently photographed and featured on postcards and in calendars. We also stopped to take photos of the churches before continuing to the village where we had a short stroll admiring many historic wooden houses. There is also an interesting plaque listing families which initially settled here, most of them with clearly German-sounding names. But it was time to move as Mahone Bay was just a teaser for the real gem of the region, the historic town of Lunenburg. Located just over 10 km from Mahone Bay it is one of the best examples of planned British colonial settlement in Canada (if not in the whole of North America) and as such its Old Town is designated since 1995 as an UNESCO World Heritage Site. Like Mahone Bay Lunenburg was settled by protestants from Germany, Switzerland (and some from France) which were brought by the British authorities dissatisfied with earlier English colonists. 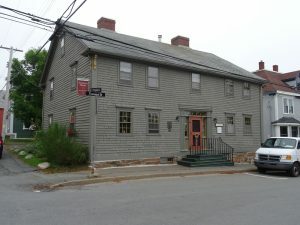 The town was raided during the American War of Independence and during the war of 1812 it was heavily involved in privateering activities against US shipping. 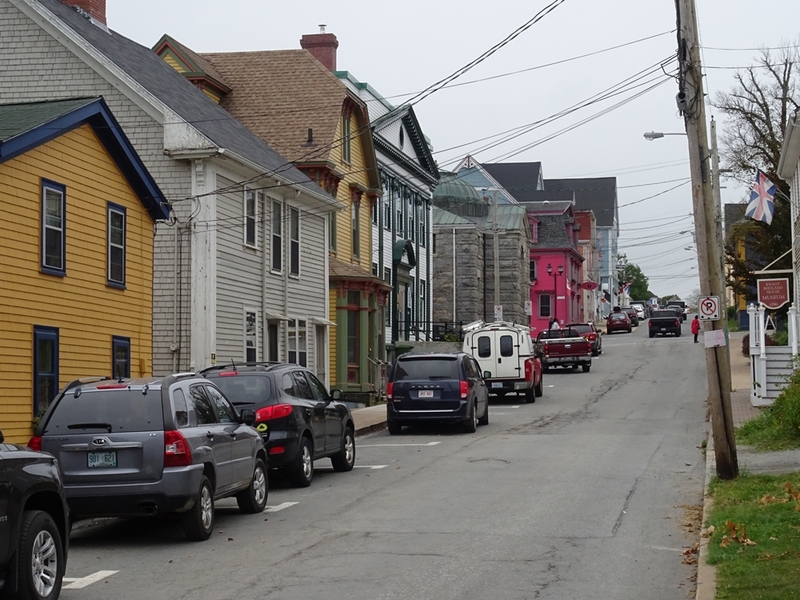 After that things got calmer and fishing became the mainstay of Lunenburg. Nowadays it is tourism which dominates the town and it is full of B&Bs, shops and restaurants. We left our car in the harbour car park and immediately went for a stroll around the historic core of the town. The streets form an orderly grid pattern which is filled with plenty of old wooden homes, many of them standing for well over 200 years. 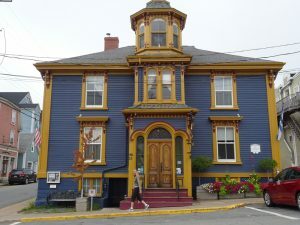 One of them, the Knaut-Rhuland House, was converted (or rather just preserved) into an interesting small museum depicting life in the early years of Lunenburg. Another fascinating historic structure is St. John’s Anglican Church, located on a green square in the middle of the old town grid. 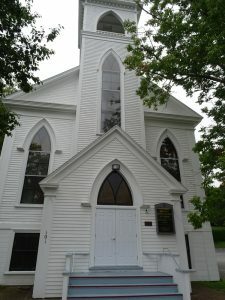 Its oldest part dates from 1754 when it was built as a simple meeting house. It was subsequently enlarged and redeveloped over the centuries into a structure resembling a giant white wooden wedding cake which we can see nowadays. What makes it even more interesting is the fact that it was badly damaged by fire in 2001. Since then it has been beautifully restored, including its painted ceiling over the altar which resembles a star-lit night sky. We walked around the town for quite a few hours as almost every corner opened yet another photogenic vista. I took hundreds of photos. 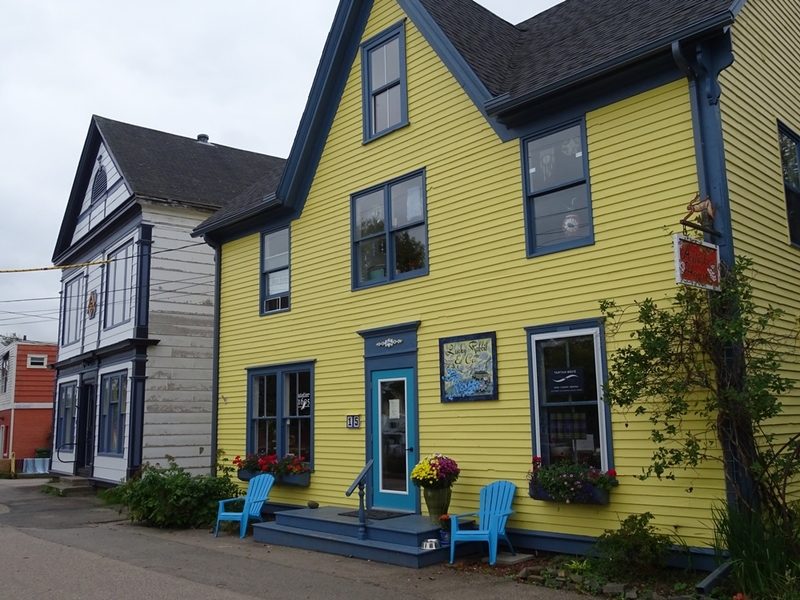 What makes the town of Lunenburg particularly photogenic is the fact that most of the buildings are painted in many bright colours. It makes the town look bright and interesting even on a rather grey day, as during our visit. Finally we headed back towards the waterfront when we had lunch on a terrace overlooking the harbour. The food was decent, the view was splendid, the only thing missing was a bit of sunshine. However it didn’t matter much, we still had a good relaxing time. I guess over the years of travelling to places that do not always guarantee glorious weather I have learned to appreciate places in any condition. Anyway, it wasn’t raining and it wasn’t windy. Wind is one thing I hate. After lunch we explored the town’s harbour a bit closer. 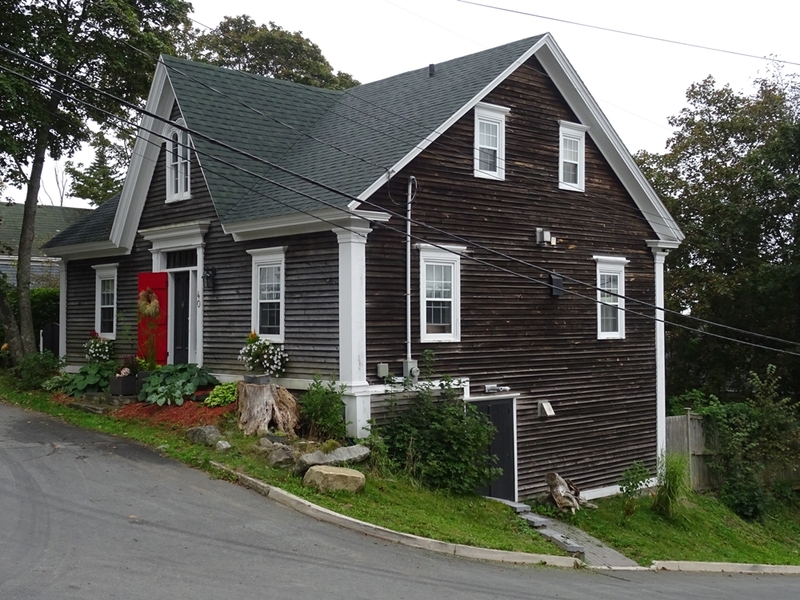 It is dominated by the imposing and brightly red building of the Fisheries Museum of the Atlantic. We didn’t get inside, we preferred to stroll around the waterfront looking at some historic boats as well at boats entering and exiting the harbour. Anyway, it was time to get moving as we had one more destination planned for that day. From Lunenburg we drove 140km across the Nova Scotia land mass to the shores of the Bay of Fundy. The interior of the province is sparsely populated so the drive was fairly quick and uneventful (not to say a bit boring). Our destination was the town of Annapolis Royal which is, to be precise, located on the banks of Annapolis River but only a few miles from its outlet to the bay itself. It is one of the oldest European settlements in Atlantic Canada. It was initially created as the French settlement of Port Royal but it was renamed by the British in honour of Queen Anne following the siege in 1710. The town was the capital of Acadia and later Nova Scotia for almost 150 years, until the founding of the City of Halifax in 1749. Well that’s only a brief basic history, the town actually changed its location by about 10km, it was settled by the Scots for a while, and it faced a total of thirteen attacks, more than any other place in North America. I guess you get the picture. One interesting fact is that it was also likely to have been the site of the introduction of apples to Canada in 1606. 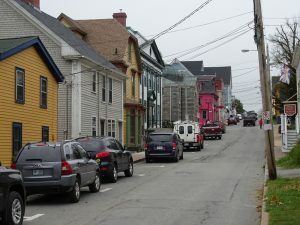 Nowadays it is a rather small and sleepy community with colourful historic wooden architecture not dissimilar to what we have seen earlier in Mahone Bay or Lunenburg, just with less of it. Anyway, one can only take as much of the same so we went straight to the site of Fort Anne. 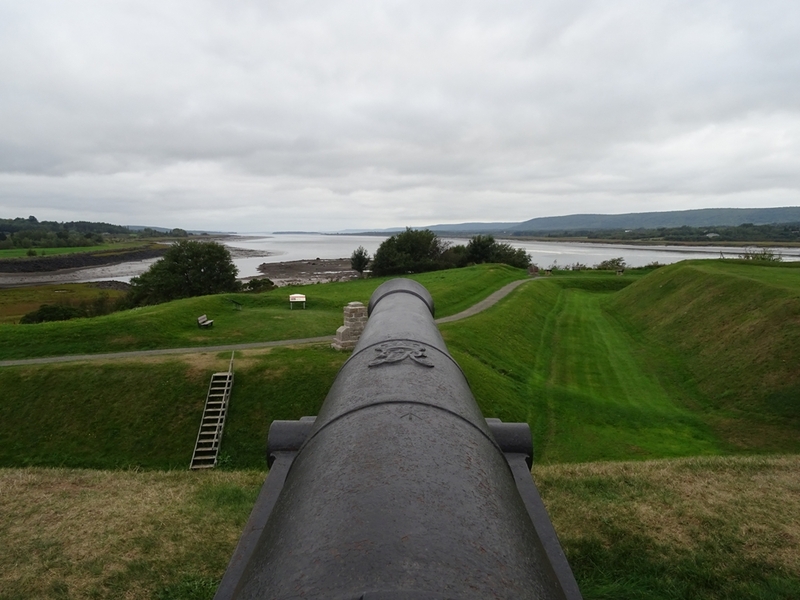 The site has been fortified since 1629, when the Scots came to colonize Nova Scotia and built Charles Fort. The region reverted to French control in the 1630s and Charles de Menou d’Aulnay began work on the first of four forts on the same site, then known as Port Royal. In 1702, the French began construction of the current Vauban earthwork that is found there today. During Queen Anne’s War, the fort fell to British and New England troops after a week-long siege in 1710 which marked the British conquest of Acadia. 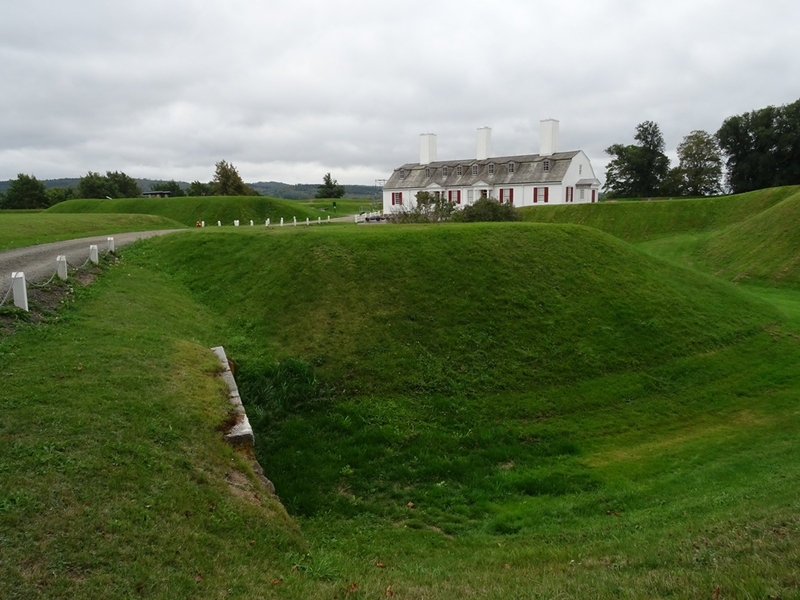 Today, the fort – Canada’s first administered National Historic Site – consists of a renovated 1797 officers’ quarters (now a museum) and 1708 stone powder magazine, surrounded by a maze of defensive ditches, banks and bastions known as Vauban-style earthworks. We arrived too late for the museum so spent some time simply wandering around the ramparts and admiring the views of the river. In moments like that I try to imagine how it was to live in such remote places in the times of the first settlers. Now we can fly back and forth from Europe in a few hours and one can drive anywhere in the province also in a few hours. Back then it must have been the end of the world, something akin to a space station nowadays. After a night in Kentville (1 hour away) the following day we stopped at Gran-Pre National Historic Site. 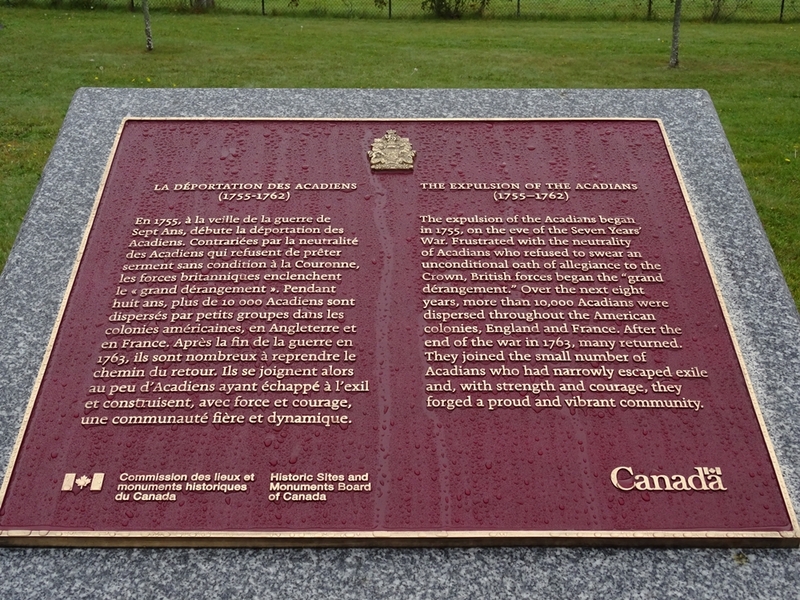 It is a place set up to commemorate Acadian settlement which existed here from 1682 to 1755. 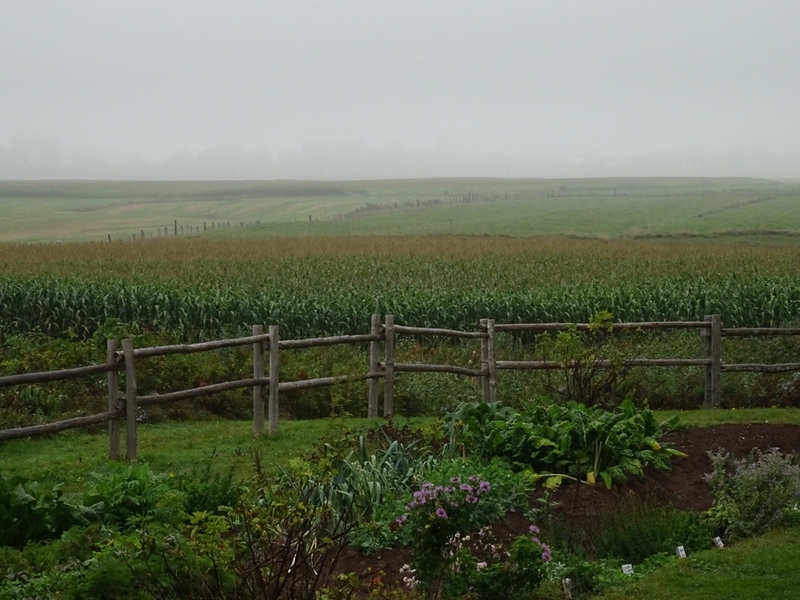 Acadians were French speaking settlers which in this area which developed a highly productive farming by building dykes and draining the fertile tidal marshes on the shores of Bay of Fundy. They created distinctive culture but sadly were caught in the grand colonial conflict in North America, between the French and the British. They were deemed untrustworthy by the British and were brutally deported between 1755 and 1762. Many were sent all the way back to France (even if some of them have never been there as they were already born in Acadia) or to other parts of the French empire. Some ended up further south, as far as Louisiana, where they started a new culture, the Cajuns. Only a very few ever came back to their homeland, renamed later as Nova Scotia. 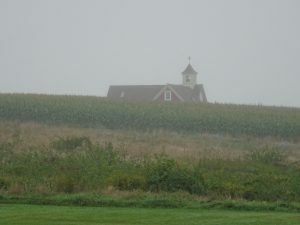 Nowadays there is a great interpretive center run by Parks Canada and explaining history of the region as well as techniques used by the Acadians to build the dykes and drain the marshes. 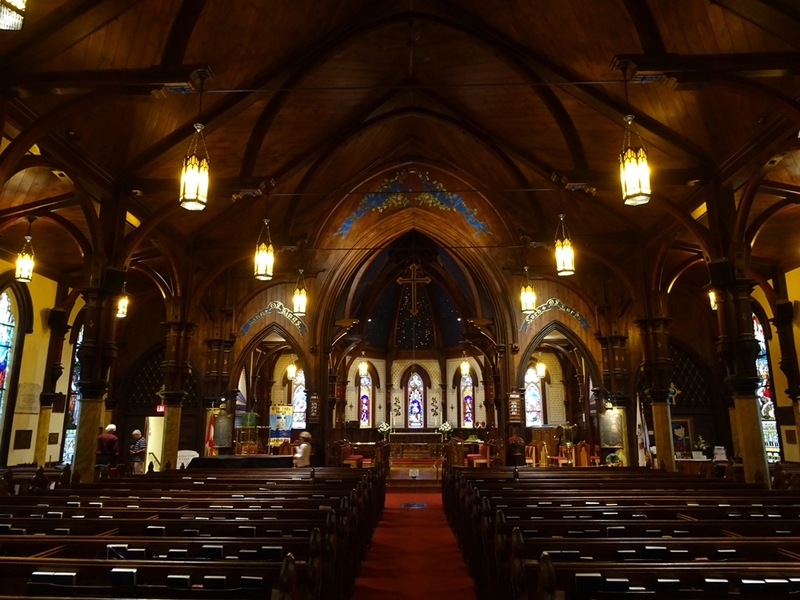 There is also a statue of Evangeline (heroine of the Longfellow poem) and the Memorial Church. But the best way to appreciate the sense of history here is to just go for a walk around some of the preserved farmland and rural landscape around. 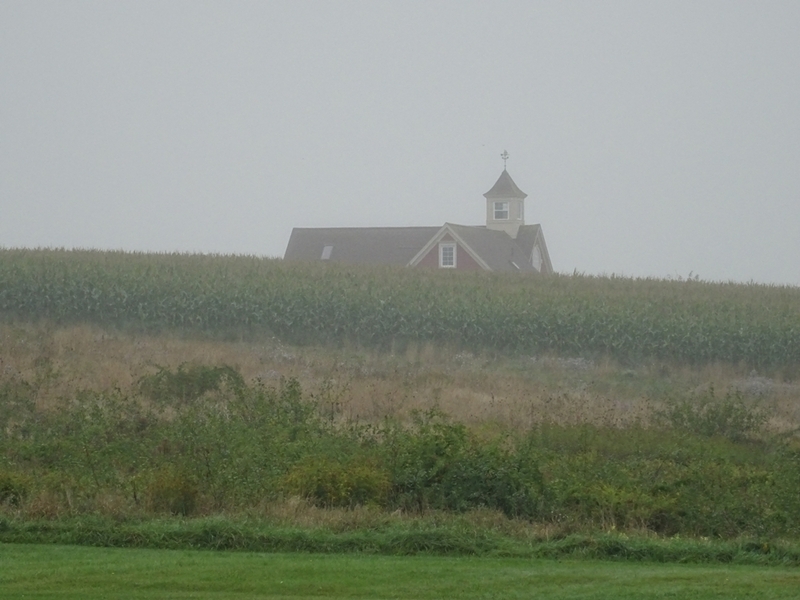 We visited the place on a grey foggy morning which made the place feel even more poignant. As we strolled around we could almost feel the sadness in the air. It really makes you think about history, how it affects real people. Grand-Pre was our last stop in Nova Scotia. From now we started the long drive back towards Quebec. Our ultimate destination before flying back home was the fascinating metropolis of Montreal. 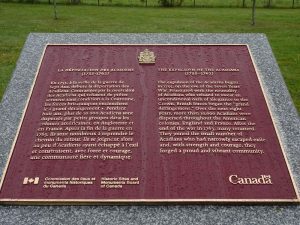 This entry was posted in Uncategorized and tagged Acadians, Annapolis Royal, Fort Anne, Grand-Pre, Lunenburg, Mahone Bay, Nova Scotia on December 1, 2018 by admin.